Morbid Anatomy: ANNOUNCEMENT: Morbid Anatomy Residency at Brooklyn's Historic Green-Wood Cemetery! ANNOUNCEMENT: Morbid Anatomy Residency at Brooklyn's Historic Green-Wood Cemetery! We are beyond delighted to announce that Morbid Anatomy has a found a temporary new home at Brooklyn's fabulous Green-Wood Cemetery! 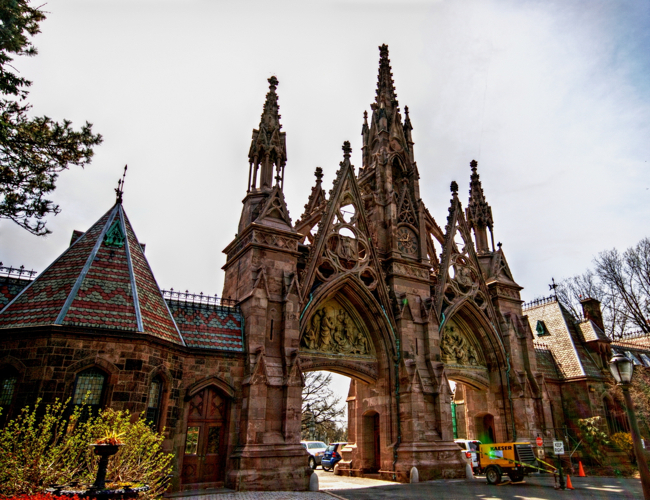 The residency will be housed in The Cemetery's city landmark 1877 Fort Hamilton Gatehouse (see below). In the attic (below left) will find a new iteration of the Morbid Anatomy Library. Downstairs will feature The Power of Images: Life, Death, and Rebirth, a new exhibition curated by Morbid Anatomy's Laetitia Barbier and Joanna Ebenstein and featuring artworks, artifacts and ephemera from the hand (or private collections) of Kahn and Selesnick, Dana Sherwood, Rebecca Purcell, Ryan Matthew Cohn, Shannon Taggart, Lourdes Sanchez, The Stephen Romano Gallery, Invisible Gallery, Evan Michelson, The Reanimation Library, Friese Undine, J D Powe, Ronni Thomas, Daisy Tainton, Lado Pochkhua, Brian Cotnoir, Joel Schlemowitz, Eva Aridjis, the Green-Wood Cemetery Archives and more. The Fort Hamilton Gatehouse is right inside the Fort Hamilton gate, located at Fort Hamilton Parkway and Micieli Place, easily accessible on the F and G trains at Fort Hamilton Station or Church Street Station. If arriving at the main entrance (25th Street and 5th Avenue) the Gate House is approximately a 25 minute walk through the Cemetery. The exhibition is not handicap accessible. The residency will be free and open to the public on weekends, March 31 - June 24, 2018, from 12 - 5. We will also be producing a series of lectures, events, tours and parties as part of the residency; stay tuned for more on that. We are currently seeking volunteer docents for both the library and exhibition. The shifts will be from 12-5 Saturdays and Sundays, and there is parking on the premises. Sadly, there is no wifi. Docents will receive free admission to one of our Green-wood events in exchange for a shift. If you are interested, please email morbidanatomy [at] gmail.com.